Make no mistake, the decision by the National Basketball Association to sanction Donald Sterling was not a foregone conclusion. Many players and observers feared they would be left disappointed by a tepid response to the bigotry heard in the rantings of the Los Angeles Clippers owner. Indeed, the National Basketball Players Association (NBPA) and many of the current play-off teams had already made plans for game-day activism had NBA commissioner Adam Silver not been decisive enough. Some had decided to walk on to the court when introduced to the crowd prior to a game, then promptly walk off again. Others were intent on not showing up at all. In the end, there was no need to have worried, although the NBPA has made it clear that it will only be totally satisfied the issue has been dealt with properly when Sterling and the Clippers part company. Silver looked openly disgusted as he addressed the media on Tuesday following the conclusion of an investigation into racist comments made by Sterling in a taped conversation leaked to the public last week. He proceeded to announce that Sterling - one of 30 team owners - has been banned from participation, attendance or association with the NBA for life. The fine was only a token amount for a billionaire, just $2.5m (£1.5m), but it was the maximum permissible under the NBA's internal regulations. Then came the truly bold move by Silver as he called on the other 29 owners to vote in favour of forcing Sterling to sell the Clippers. It is clear from the dozen or so major sponsors who have ended their relationships with the Clippers after Sterling's comments became public that Silver's stance was based as much on sound business sense as it was on complying with the league's stated values and principles. That is because this incident does not just damage the Clippers, it also damages the NBA. As for Sterling, do not feel sorry for this bigot if he is forced to sell. This is not a question of curtailing free speech, this is about the NBA finally and explicitly declaring bigotry has no fit with their sport. A plantation mentality still exists with some owners and administrators. However, it is not just black people being treated badly but women, homosexuals and other ethnic minorities. In the case of Sterling, he would hire black men and even take a black woman as his mistress, but he did not want them at a Clippers game, nor to have a "selfie" with them. That attitude strips sport of any higher purpose just as it diminishes those it strips of their dignity. As I have said, do not feel sorry for Sterling. He bought the Clippers in the 1980s for $12m (£7.1m) and they are now worth at least $800m (£474.5m). Even if other owners succeed in pushing him off his lofty perch, his parachute is very, very golden. This may be a watershed moment for basketball, one of those few times executives, owners, fans, players and retired players' associations are all on the same page in their rejection of the sentiments of hate. Sadly, I think it highly unlikely that this moment for the NBA will be a catalyst for other leading leagues to act. I applauded the NBA's decision but was then immediately saddened when I compared their stance with the relative inaction on such issues in other sports like football, both domestically in the United Kingdom and from international federations. Think about the boldness of the NBA's resolve here. The deeply offensive but private words of a team owner are made public via a gossip site and within three days he is entirely disassociated from the league. On the other hand, I look at football and see bananas continue to rain down on pitches, fascists chanting abhorrent messages, homophobes grinning while holding offensive murals. Nothing seems to be done. Sanctions for acts that are at least as distasteful and certainly as damaging to football as Sterling's 11-minute racist rant was to basketball seem to receive a slap on the wrist in contrast. I was reminded by a fan on Twitter of the "vigorous resolve" of football to stamp out bigotry. All I can say in response is that either football is apathetic or it is impotent in its efforts. Most of its education campaigns strike me as PR window dressing. Its sanctions are laughable in the face of the money involved in the game. As for a sense of urgency, when do we ever see an incident arise on a Sunday and an investigation completed and sanctions levied by the Tuesday afternoon? I know Silver. He has a tough job following David Stern, his predecessor, but he has passed this test of his leadership well. There are still questions, of course. 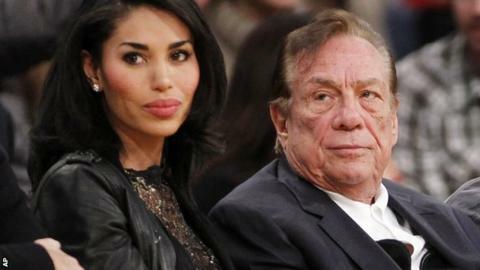 The fact is that the NBA has known that Sterling has long had 'issues' with race. From the United States justice department's biggest ever settlement for an issue of housing discrimination, to being sued by Elgin Baylor, an NBA legend and former Clippers general manager, there should be scrutiny of the number of years Sterling has been given a pass. However, in a crucial moment when the league had to act decisively, it did that - and that is a decision sport can build on. When talking about similar incidents in football, which deals with seemingly systematic issues of bigotry, I have always said that the banana-throwing, homophobic and anti-Semitic chanting and the like are just symptoms of the internal lack of resolve to really root out such issues. Instead, football should look to educate supporters, empower players, review policies and, yes, harshly sanction owners, administrators and teams when they err, not just punish fans who have taken their cue from the sport's impotence. In fact, all of sport should take a cue from the Sterling incident. The fleeing sponsors, the media firestorm, the fan outrage and the player activism show what can happen if sport continues to fail to act. If football does not act, its failure emboldens the bigots, both in the stands and in the boardrooms, to the extent that the monster that is eventually created corrupts the beautiful game.